Product Details of WorkCentre 5735/5740/5745/5755 WorkCentre 5735 - 5740 - 5745 - 5755. Maximum paper size: 11 x 17 in./A3. Print resolution: up to 1200 x 1200 dpi. Standard paper capacity: 4,700 sheets. Maximum paper capacity: 8,700 sheets. sheets. 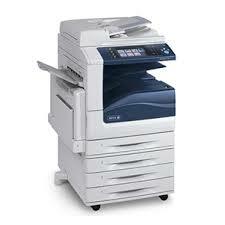 100-sheet Duplexing Automatic Document Handler. Numerous finisher options for hole punching, multi-position stapling, saddle-stitching, and C and Z folding.